View a PDF of the report, "Not Only Unequal Paychecks: Occupational Segregation, Benefits and the Racial Wealth Gap"
Today, the Institute on Assets and Social Policy (IASP) at Brandeis University and The Workers Lab released powerful findings based on new research on the state of employment inequality beyond paychecks, and how the workplace contributes to the racial wealth gap. The report also includes key recommendations for employers and other key stakeholders to immediately address these issues in order to transform industries and address racial inequality in the workplace. This pivotal report, “Not Only Unequal Paychecks: Occupational Segregation, Benefits, and the Racial Wealth Gap,” reveals prevalent racial inequalities in the workplace contribute to the current racial wealth gap in America. It also describes how occupational segregation and benefits disparities -- including access to affordable healthcare, paid time off, family leave, and more -- contribute to lasting detrimental effects to workers. These inequalities have a critical long-term impact on the financial security of working people and their families. "Occupational segregation doesn't just engender unequal paychecks for African American and Latino workers, it also generates inequality in other forms of compensation, such as benefits, and robs these workers of wealth-accumulating opportunities,” says Tom Shapiro, Director of IASP. “Racial injustice and dwindling worker power interlock in a way that maintains systematic wage and benefit inequality and widens the racial wealth gap." 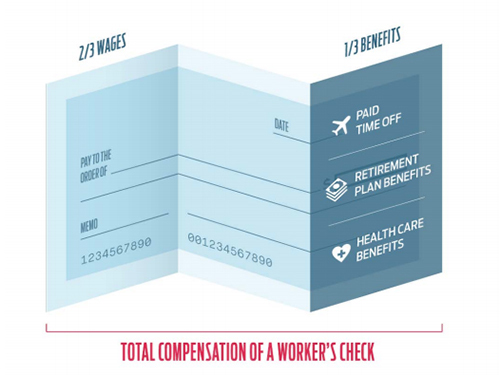 Workplace quality and comprehensive employee compensation packages are often crucial access points for asset-building opportunities in the U.S. “Not Only Unequal Paychecks” indicates that benefits actually make up about one-third of total employee compensation. Furthermore, other wealth-building benefits are highly inaccessible to employees of color. Across five major industries examined in the report -- restaurant, construction, healthcare, finance, and STEM -- access to retirement and health benefits are systematically lower for Black and Latino employees relative to their white peers in the same fields. Due to occupational segregation by race and ethnicity, employees of color face substantial barriers to quality jobs and wealth-building opportunities at work. In the five major industries studied in the report, the typical wealth of Black and Latino employees is tens of thousands of dollars less than white peers in the same fields, revealing that even access to high-paying job fields is not enough to level the playing field. Persistent occupational segregation by race and ethnicity permeates the U.S. workplace. In five key industries, nearly two-thirds of Latinos work in low-paying, restaurant and construction jobs with few or no benefits, driving income and wealth inequality and widening the racial wealth gap. Barriers to pension benefits rob $5,600 in wealth from Black workers and $9,800 from Latino workers; employers’ denial of health care coverage strips $2,700 in wealth from Black workers and $5,400 from Latino workers. Even when working people of color enter into higher-compensated fields, pay gaps are substantial and reveal large differences in economic security among peers in the same field. Despite similar education backgrounds, large racial wealth gaps and unequal benefits persist, especially in STEM. Ensure basic thresholds of security are met for all: Basic standards of economic security should be available to everyone in the United States. Invest in the security and prosperity of workers by prioritizing the well-being of our communities and ensuring that no one falls between the gaps in our safety net. Enhance workplace benefits: The current employer-based benefits system is insufficient to ensure the income and asset security of most workers, particularly workers of color. Minimum standards for workplace benefits such as paid-time off and family leave should be expanded on the national level. Policy reforms should also prioritize expanding access to pension and health coverage for workers as well as enhancing quality and participation. Escalate access to well-paying fields: National investments should reflect a commitment that all people have a right to quality jobs. The data in this report reveal we fall far short of that ideal. Our unequal and highly segregated educational system does not meet our national aspiration to provide equal opportunity for all. To read the full report online, please visit the IASP website here. The Institute on Assets and Social Policy (IASP), located at the Heller School for Social Policy and Management at Brandeis University, works to improve our understanding of inequality by examining how assets and asset-building opportunities impact the well-being, financial security, and social and economic mobility of individuals, families and communities, particularly those left out of America’s economic mainstream. In collaboration with our research partners, constituency groups, and practitioner organizations, we use a racial equity lens to explore the role that assets play in inequality and insecurity, and the structural and institutional barriers to asset development. The Workers Lab invests in innovation and experiments that build power for working people in the 21st century through a number of means, including supporting partners in the public, private, and non-profit sectors in early stage experimentation; convening leaders from multiple sectors to develop solutions to the most pressing issues facing workers, and partnering with foundations and investors to double-down on what works. Founded by Dr. Carmen Rojas in 2014, The Workers Lab is based in Oakland, California. In Politico's Telehealth Roundup, Stuart Altman says he's not that impressed with the Trump administration’s proposal for making hospital prices transparent.